European elites now want a re-vote until the Brits get it “right”… or perhaps they ignore the referendum altogether. But that’s not going to stick. The British people have spoken. And I don’t think the world will ever be the same. CNN’s teleprompter reading dolts spent months calling the Brits xenophobes, racists, fascists and stupid. All because they wanted to reclaim the right to govern themselves. Well, the Brits sent everyone a clear message last week: Piss off. They rejected the establishment’s “hair on fire” fear campaign to keep the U.K. under the oppressive thumb of Brussels’ unelected bureaucracy. And frankly, if you’re not feeding at the Eurocrat trough, Brexit is easy to understand and appreciate. Brits simply voted to restore local government rule that had been outsourced to drunken party boys living off trust funds in other countries. If you believe that’s racist or fascist, then perhaps a call to your shrink with a major load up on lithium is in order. Did you know that the EU has unaccountable commissioners with the power to legislate and overrule the elected parliaments of member states? That set up would have worked well for Stalin circa USSR’s heyday… but it’s not a good fit for the British. And contrary to media narratives straight out of Hollywood scriptwriters, the Brexit movement wasn’t hijacked by some tiny, far-right faction of Hitler youth. Nearly one-third of left-leaning Labour voters voted for Brexit. Turnout? 72.2%! That’s higher than any U.K. general election since 1992. And the 52% total vote cast for Brexit is higher than any winning governing party since 1931. The British have had enough of the erosion of sovereignty, 10 years of interest rate manipulation and politicians bought and paid for by sketchy Middle Eastern “new” money. 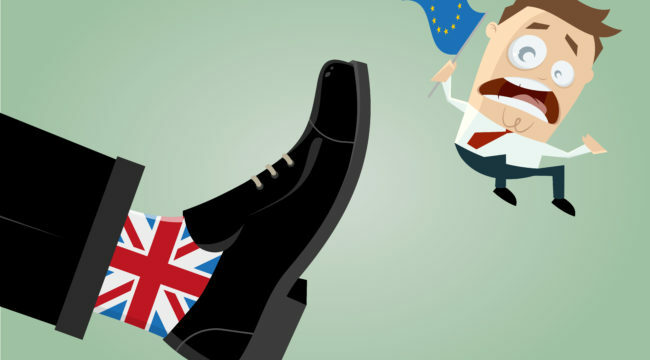 What does the Brexit mean to the markets? Nobody knows what will happen next. Don’t be surprised if the British pound and British stocks have a rocky summer. Don’t be surprised if all markets get rocky. Could Brexit lead to another collapse like 2008? Sure, it’s possible. But let’s not forget the role of central banks. After Friday’s chaos, global central banks announced they stand at the ready to intervene should any liquidity issues arise. What if they all decide to deploy their “helicopter money?” Instead of a collapse, we could get a melt up. My point is… you can’t make investment decisions based on the assumption that a market collapse is not guaranteed. I believe the U.K. will be fine. It’s the world’s fifth-largest economy. And it will only get more competitive as it escapes from the EU’s “one world government” fantasy. The real question is what happens to the EU from here? That’s what markets are worried about. The German and French markets fell almost twice as much as British markets on Friday. And that’s because Brexit is far worse for the EU than it is for the U.K. In those countries, people have genuine reasons to be angry with the EU. If the British can get out and the economy survives, as it will, then why not the Italians or the French? It will be harder and harder to make the case for staying. That’s where the real danger and opportunity lies. A Eurozone break-up would be a major market event with implications as serious as the global financial crisis. Many large European banks would fail. That could lead to a Lehman Brothers-type crisis writ large. I actually see something possible far beyond Lehman. We could see so-called respected nation states literally disintegrate like Syria, becoming borderless “Mad Max” swaths of land where “Lord of the Flies” becomes the law. Well, the last thing you want to do is listen to the mainstream predictions that Brexit will cause apocalyptic biblical plagues. As trend followers, we’re prepared for any and all eventualities. For example, trend following made huge money during the stock market crash of 1973–74, Black Monday in 1987, the Long-Term Capital Management implosion and the Asian Crisis in 1998, the dotcom stock market crash of 2000, the Great Recession of 2008-09, the oil market crash of 2014-16 and Brexit. Even Brexit was a great opportunity? Two of the most famous trend followers, David Harding and Larry Hite, made 3% and 4% on Friday alone. All that fear, dread and hang-wringing by the media hacks? Forget that. We are here to protect ourselves and profit. We’re happy to ride trends wherever they take us in whatever unpredictable market climate we face. And we’re also happy that the Brits took a historic stand for freedom and self-determination. Let’s hope that’s contagious as hell. Please send me your comments to coveluncensored@agorafinancial.com. Today, Jody Chudley reveals one market that hasn’t been this cheap since Nazis were overrunning Europe. Can you guess which one he’s referring to? Michael Covel has been teaching trend following strategies to individual traders, students, hedge funds, pensions and family offices for the past two decades. He has helped more than 7,000 clients in over 70 countries learn how to make money with trend following. He’s the author of five books, including the international best-seller Trend Following: Learn to Make Millions in up or Down Markets (named best trading book of the last 15 years) and his investigative narrative The Complete TurtleTrader: How 23 Novice Investors Became Overnight Millionaires. His first documentary film is Broke: The New American Dream. Fascinated by like-minded traders that quietly generate spectacular returns, he has uncovered astonishing insights about how they think, strategize and execute their systems. His impressive network of contacts among the best traders in the world has given Michael a unique edge in the world of quantitative trend following investments. Michael is also the voice behind Trend Following Radio, the underground alternative hit that has been as high as No. 2 on the iTunes investing channel, reaching over 3 million listeners across 182 countries and territories. Guests have included Nobel Prize winners in economics (such as Daniel Kahneman and Harry Markowitz) and some of the best traders in the world (such as Ed Seykota and Larry Hite, who have been featured in the famous book Market Wizards).